Tomorrow night the two VP candidates - Mike Pence and Tim Kaine will debate at Longwood University in Farmville, Virginia. The event will begin at 9:00 Eastern Time and will run for 90 minutes with no commercial breaks. Twenty-eight years ago, on the evening of 5 October 1988 - Lloyd Bentsen and Dan Quayle met in Omaha in the only Vice Presidential debate of that campaign. And although he and his Presidential Running mate, Michael Dukakis would lose the general election a month later - Senator Bentsen delivered one of the more memorable lines of any debate in American history. The video above contains a portion of this debate - while the transcript below is somewhat more complete. What follows is a partial nonverbal analysis. Tom Brokaw: Senator Quayle, I don't mean to beat this drum until it has no more sound in it. But to follow up on Brit Hume's question, when you said that it was a hypothetical situation, it is, sir, after all, the reason that we're here tonight, because you are running not just for Vice President — (Applause) — and if you cite the experience that you had in Congress, surely you must have some plan in mind about what you would do if it fell to you to become President of the United States, as it has to so many Vice Presidents just in the last 25 years or so. 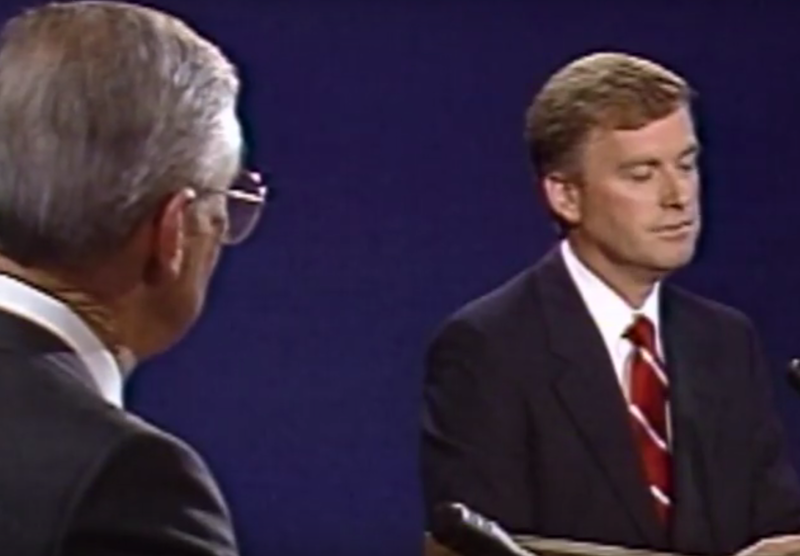 Quayle: Let me try to answer the question one more time. I think this is the fourth time that I've had this question. Quayle: Three times that I've had this question — and I will try to answer it again for you, as clearly as I can, because the question you're asking is, "What kind of qualifications does Dan Quayle have to be president," "What kind of qualifications do I have," and "What would I do in this kind of a situation?" And what would I do in this situation? [...] I have far more experience than many others that sought the office of vice president of this country. I have as much experience in the Congress as Jack Kennedy did when he sought the presidency. I will be prepared to deal with the people in the Bush administration, if that unfortunate event would ever occur. Woodruff: (Admonishing applauders) Please, please, once again you are only taking time away from your own candidate. Bentsen: You are the one that was making the comparison, Senator — and I'm one who knew him well. And frankly I think you are so far apart in the objectives you choose for your country that I did not think the comparison was well-taken. 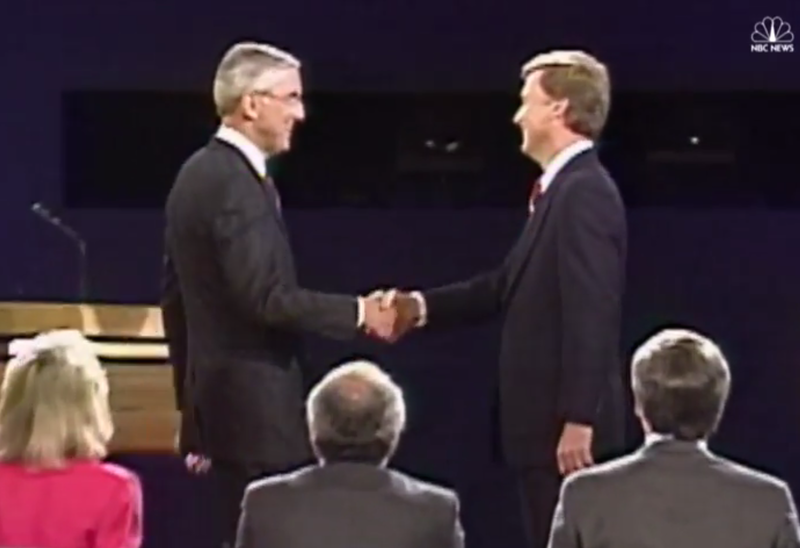 Note that in this image of the two candidates shaking hands, Bentsen is maybe one to two inches taller. 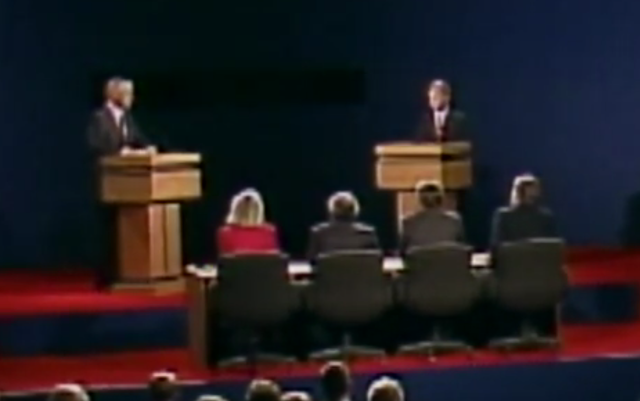 Yet when the two men are debating, Quayle seems much shorter, beta and even feeble. Earlier when they were shaking hands the younger man stood straighter - however in the midst of an attack on his qualifications, Senator Quayle slouched his shoulders and drew his arms and hands inward - betraying his lowered confidence and protective emotional tone. Senator Quayle also was, for a portion of the this exchange, standing with his right foot on the base of the lectern. This, and any similar foot position is strongly discouraged. It projects an instability, less assertiveness, lower strength and lower confidence. Intriguingly adopting such a body language configuration also actually engenders these same weaknesses. 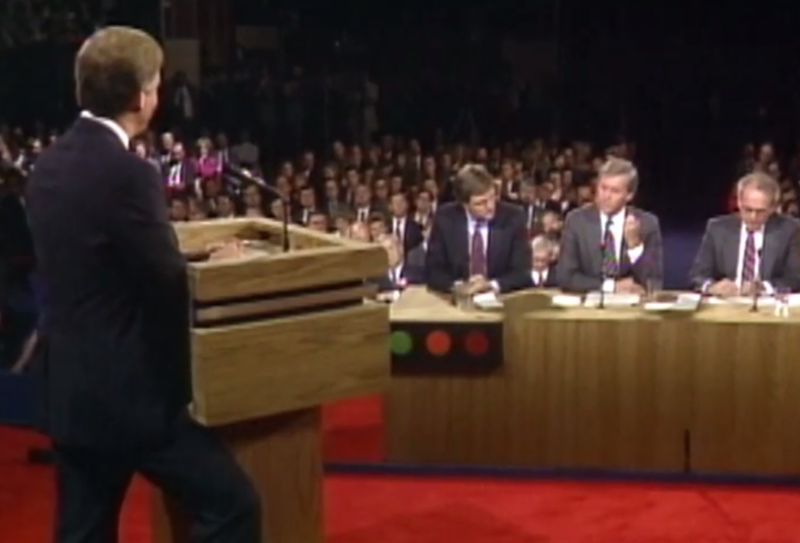 While some candidates over-utilize lectern-holding (as did Donald Trump in his debate with Hillary Clinton last week), this would have been a good time for Dan Quayle to hold the sides (and importantly also toward the front) of the lectern. It would have built his confidence and made him more alpha - while preventing him from looking quite as anxious, scolded and weak. 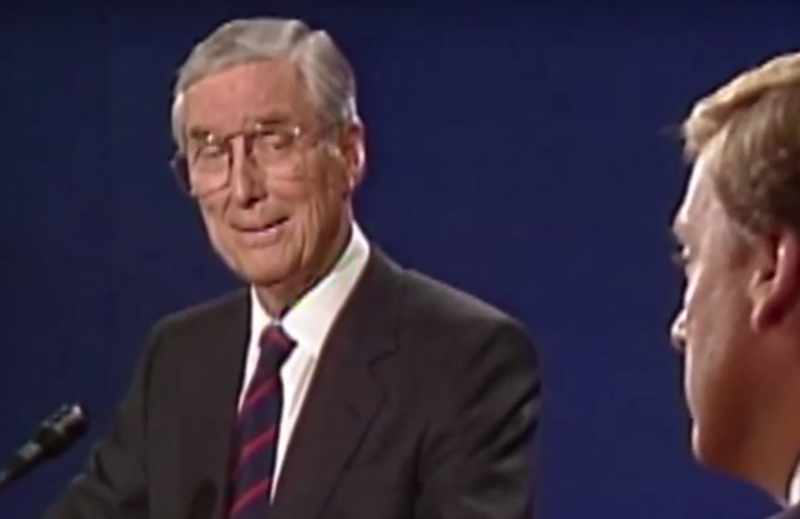 During 2:09 in the above video, as Quayle says, "... the presidency ...", Bentsen can be seen displaying a prolonged blink. This is a sign of Senator Bentsen's disbelief. Less than a second later, Bentsen displays a classic upper eyelid (partial) closure while his forehead and eyebrows elevate. This relatively uncommon facial expression signals Bensten's contempt for Quayle. 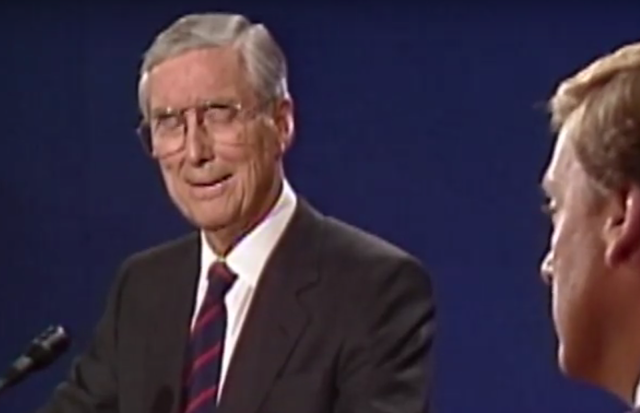 At 2:26, just after Bentsen says, "... Jack Kennedy was a friend of mine ...", Quayle swallows hard projecting his high anxiety. He knew he was losing this portion of the debate and it was showing. Profoundly. Moreover, this emotional display created a negative feedback loop, making Quayle even more nervous.